Honey-coloured stone, intricate wrought iron, window shutters with peeling grey paint, patterned floor tiles. Just some of the details of the older buildings I remember from my recent visit to the Haute-Garonne, France. I like capturing details. For me they can sum up the essence of a place. Given a riches of detail in Saint-Gauden, I made a composite of two textures I found in the town. 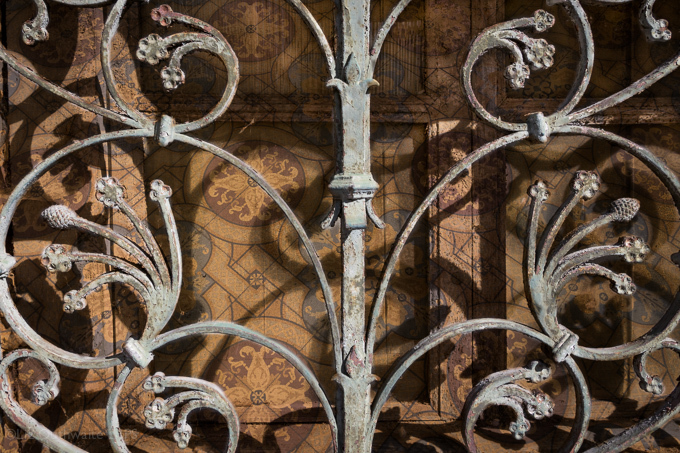 The wrought iron grill, with it rusting patina, was just a few doors down away a boulangerie, which had the most beautiful original tiled floor. For me, these two details sum up this part of France. Week 38’s recipient is Lori Patrick. I met Lori via creativelive, the online education platform. Lori runs a successful photography business in Pennsylvania. She kindly featured this project on Photo Communiqué, for which I’m truly grateful.